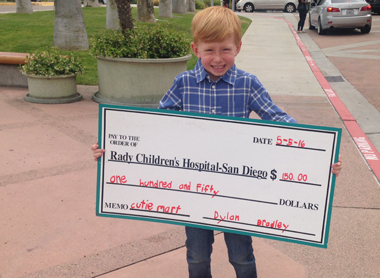 The moment Dylan Bradley laid eyes on a Rady Children’s donation jar, he began dreaming up ways to fill it and help other kids. His first idea – to open a lemonade stand – was quickly dashed when his family’s pantry yielded no lemons. What Dylan found instead was a bag of Cuties© Mandarin oranges and, in an instant, Dylan’s Cutie Mart was born. Now 7 years old, Dylan has been operating his store for nearly two years. What started as Cuties©-only shop has since expanded to crafts, snacks, toys and holiday cards. All proceeds go directly to Rady Children’s. Dylan’s hope is that the Hospital uses the money to buy expensive medicine for kids who need it. This holiday season, Dylan has a goal of raising an additional $150. He wishes to inspire other kids – and grownups, too – to give, and wants to challenge everyone to support Rady Children’s. Start an online fundraising campaign on our Facebook page here! Ask your friends and family to support you with one easy click. Support Dylan’s fundraising campaign here! When our friends at Children’s Miracle Network Hospitals and Cuties© heard about Dylan’s sidewalk stand, they decided to do something extra special for Dylan. Previous post: Round Up This Black Friday!